A fine and very original carriage clock with its orginal outer case covered in 'Moroccan leather' and unusually retains its carry handle. Push repeat and strike on mellow gong. 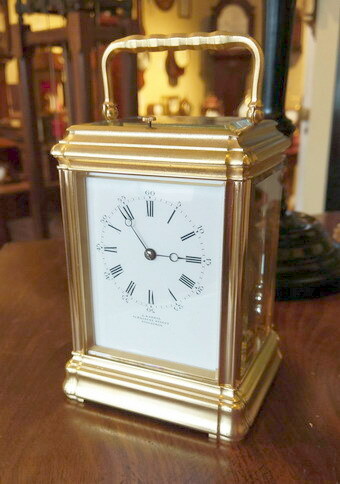 The proprtions of the clock are a little larger than average, with all original bevelled glass and the corresponding numbered key. The original gilding has been restored and the movement fully overhauled. A. Barrie of Princes Street, Edinburgh was a prestigious jeweler & retailer of clocks in Edinburgh. This clock would have been sold by them circa 1880.